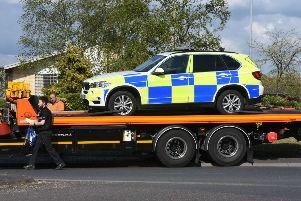 A former policeman who lives in Peterborough who drove the wrong way along the A1M in North Hertfordshire has been given a suspended prison sentence today (Monday, February 5). Motorists travelling north were horrified to see David Parfit’s car hurtling south towards them in the same carriageway. A court heard one woman motorist travelling at 70 miles per hour on the southbound carriageway and heading for London was left in a state of shock when Parfitt, in his Rover vehicle, overtook her in the northbound carriageway on the other side of the central barrier. Another motorist on the northbound carriageway who saw Parfitt’s car coming towards him only just managed to get out of the way by swerving onto the hard shoulder. At St Albans Crown Court today Parfitt (49), a former Met policemen who left the force with Post-traumatic stress disorder (PTSD) after attending the London bombings and picking up parts of bodies, pleaded guilty to dangerous driving. Parfitt of Deerleap, Bretton, also pleaded guilty to possessing a quantity of methyl amphetamine and driving whilst unfit through drugs. The court was told it was in the early hours of December 27, 2016 that Herts Police started getting calls from drivers who reported seeing the car driving the wrong way along the carriageway. Prosecutor Stephen Mather said Parfitt drove the wrong way from Junction 10, the Baldock service area, down to Junction six, the turn for Welwyn, a distance of around eight miles. Other drivers reported the Rover veering from lane to lane as it made its way south on the northbound carriageway. Police attended the area but it was eventually Parfit himself who stopped the car and was arrested by officers. A roadside breath test proved negative for alcohol, but the police were concerned about his demeanour. His eyes were red and watery and the pupils enlarged, said Mr Mather who said Parfitt was also speaking rapidly. Amphetamines were found in a pocket and a blood test later that night showed a large quantity of methyl amphetamine in his system. In a interview Parfit claimed he did not remember his driving and said he thought a drink he had been given earlier had been spiked. The court was told Parfitt had left the police force suffering from PTSD and he had received mental health treatment for his condition. Passing sentence Judge Jonathan Carroll told Parfitt he was lucky there had not been a head-on collision that night. He sentenced him to eight months imprisonment, suspended for 18 months, and ordered that he carry out 120 hours of unpaid work. Parfitt was disqualified from driving for 18 months and told he will have to take an extended driving test before he can get behind the wheel of a car again. His licence was also endorsed.